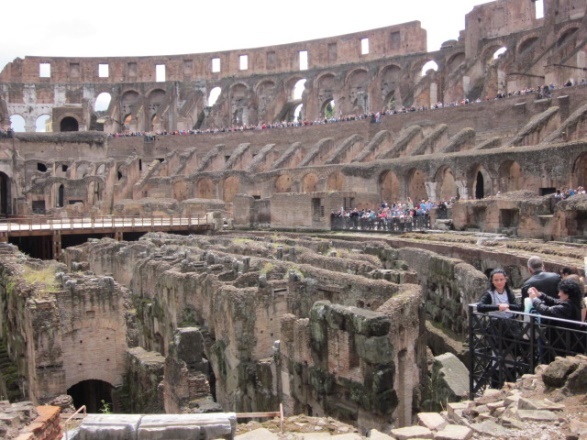 On May 1, my wife Susan and I flew out from Houston on Air Express, arriving in Rome early the next morning. 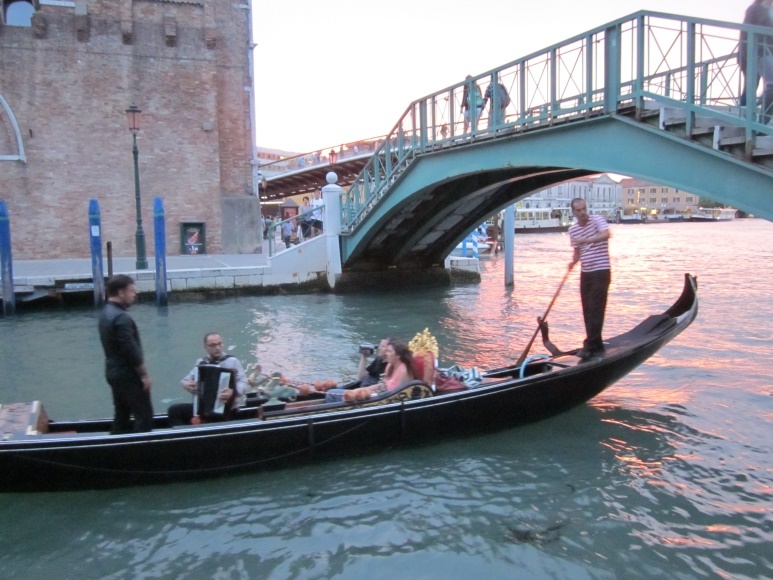 After going through Customs, we took a cab to our hotel, the NH Leonardo da Vinci. 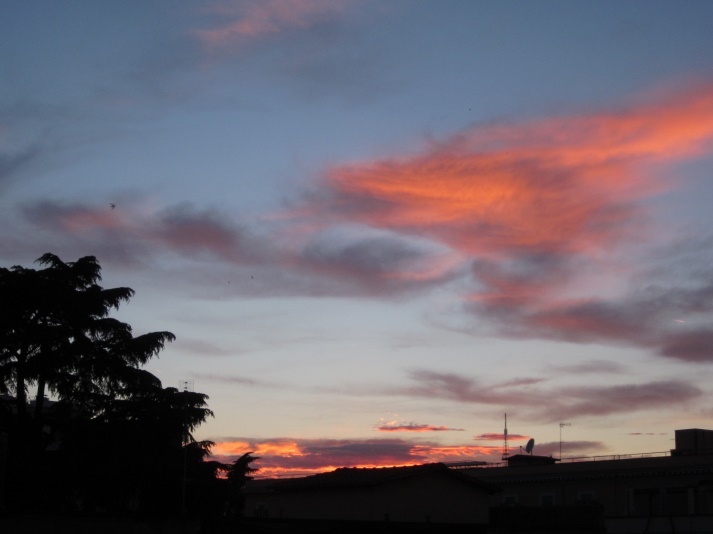 Just to show you what a great start this was, look at the view from our window (the sunset and the beautiful neighborhood houses). 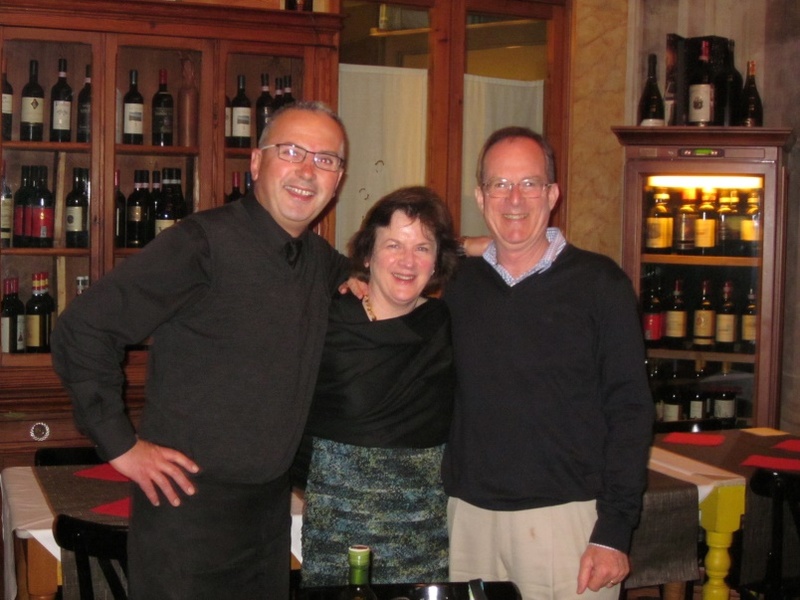 Our Local Host, Renata, was available for questions and recommendations. We stored our bags until check-in time. That afternoon Renata reminded us of the schedule, and that the coach would leave at 8. 5- What was your favorite moment on tour? 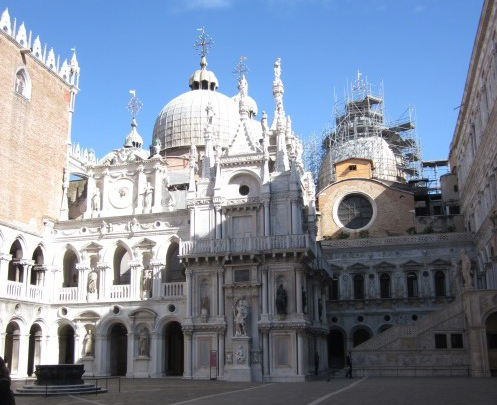 (A moment can be something that happened, a feeling, emotion, or just any specific thought while on tour) Venice alone deserves another week – even then, I wouldn’t be able to see it all! 6- What was your favorite experience on tour? 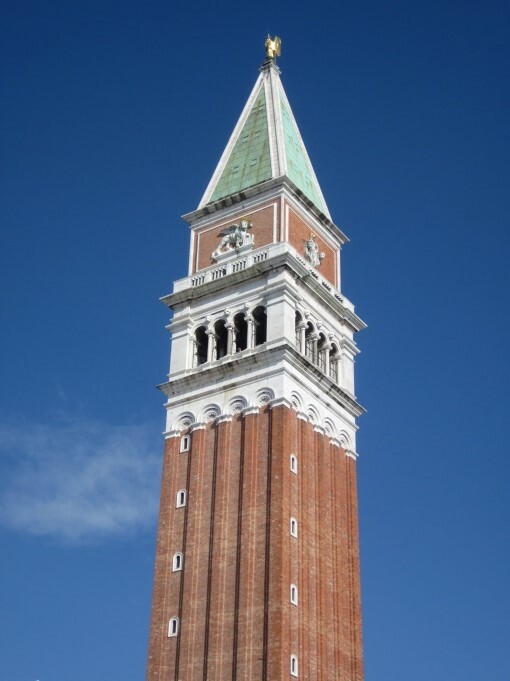 (An experience is something that you actually did while on tour) This is hard to say; but it would probably be dinner at the restaurant above the Spanish Steps in Rome. 7- Did you learn something new on this tour? If so, what? Monograms, even though marked “independent,” takes very good care of you. 8- What is the best piece of advice you have for others interested in this tour? 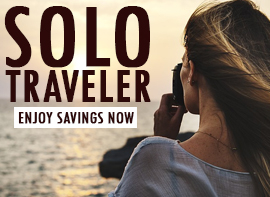 Read a guidebook ahead of time, for each area you’re visiting. 9- Give one sentence that best defines your trip. A refreshing trip, even though the 10 days went by quickly. 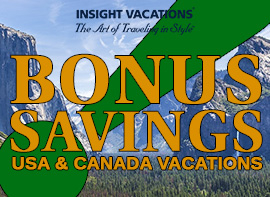 10- How could your vacation have been improved? I don’t see how this tour could be improved. 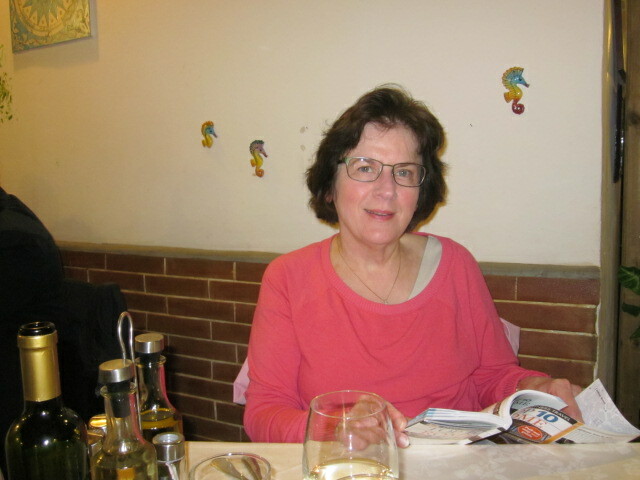 As a native of Rome, Renata knew a very good restaurant nearby. There we enjoyed one of the best meals of our trip. 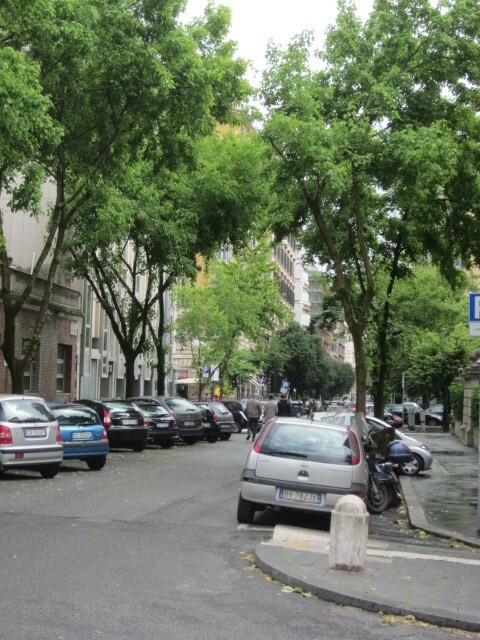 It’s called Ristorante Ambasciata de Capri, and it’s a convenient, four-block walk. Here you see views of a waiter there, Susan reading her guidebook, one of the restaurant owners (and me waiting for the first course), and a neighboring residential street. The tour coach rolled out at 8 a.m., with Renata shepherding us. A Local Guide joined us. 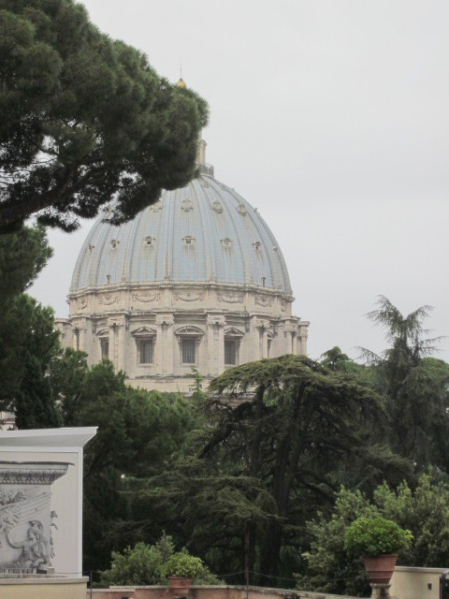 We headed to the Vatican Museums, the Sistine Chapel, and St. Peter’s Basilica. 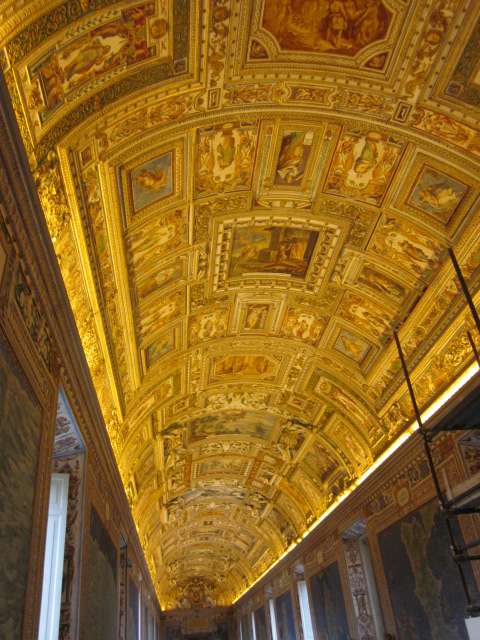 Here you see the bright and elegant visitors pavilion that forms the entrance to the Vatican Museums, a Renaissance tapestry in the Gallery of the Tapestries, the dome of St. Peter’s from the back, and the ceiling paintings in the Gallery of Maps. 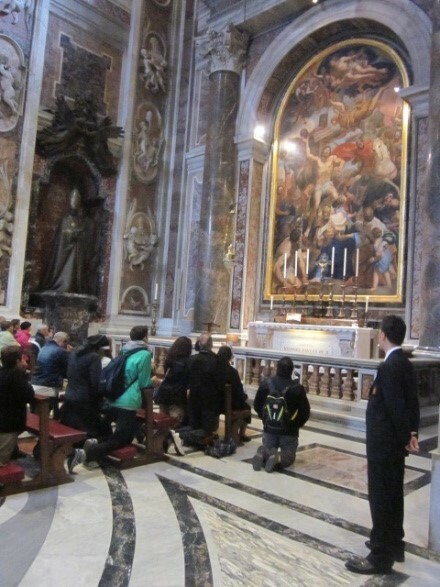 In the Sistine Chapel, photos are not allowed. 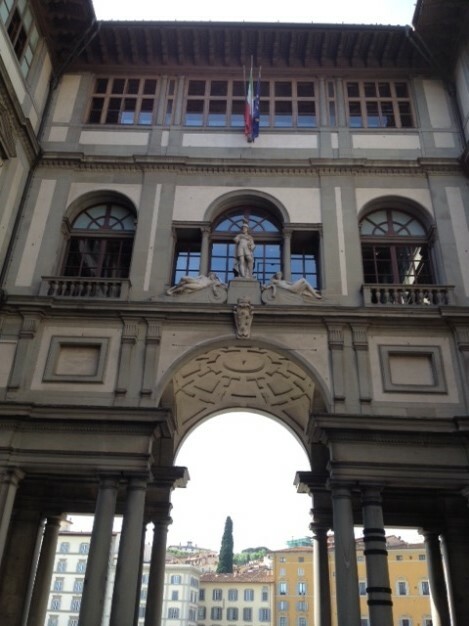 There, in silence, we viewed the breathtaking Michelangelo ceiling frescoes — including The Creation of Adam — and many other biblical scenes. Next we entered St. Peter’s Basilica. 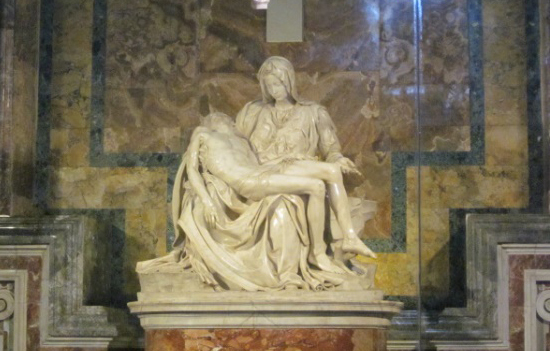 Just inside we found Michelangelo’s Pieta, Pope St. John Paul II’s tomb in the Chapel of St. Sebastian, and many remarkable works of art. 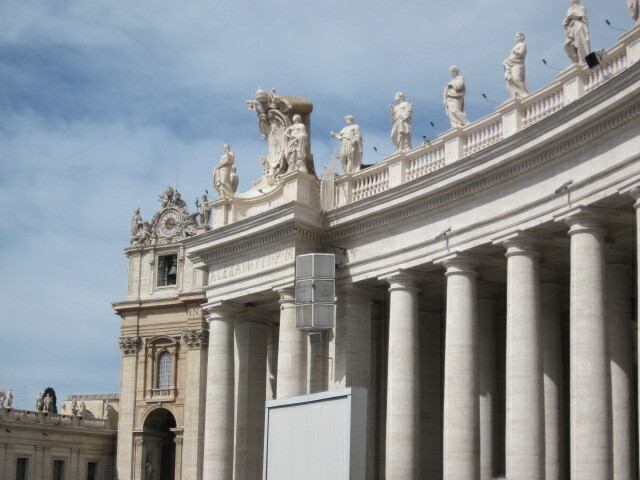 Then we stepped out into St. Peter’s Square. 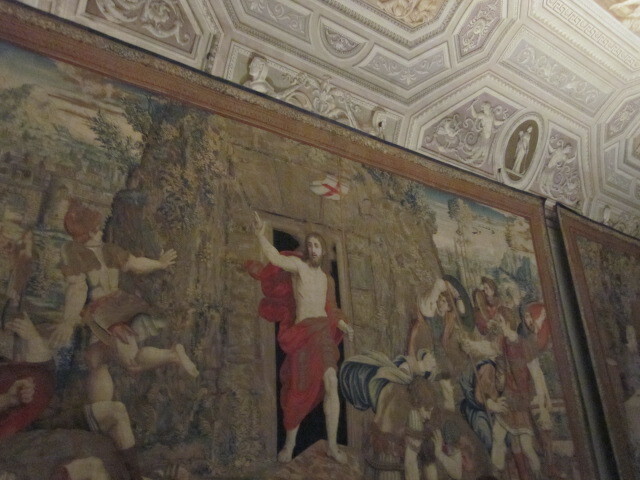 We shopped at a Vatican gift shop, where the clerk offered to have our gifts blessed by the Pope and sent to our hotel. This we gladly accepted. 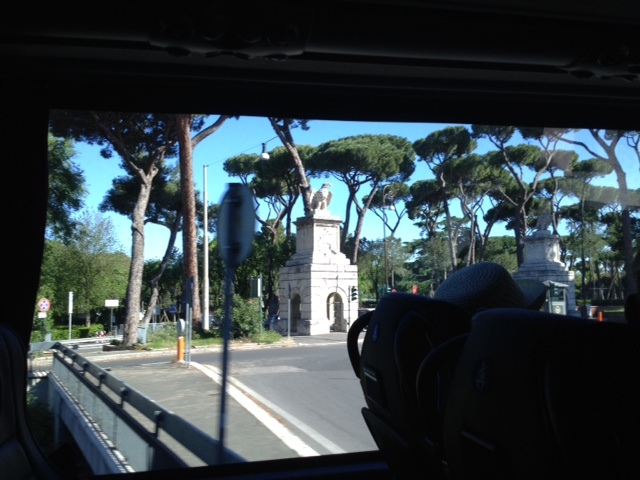 Later, we went by motor coach to the Colosseum and Roman Forum. 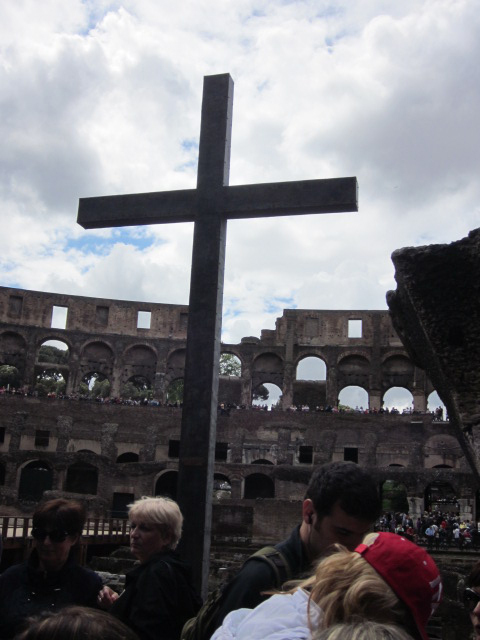 There’s a cross at the entrance to the Colosseum, commemorating the Christians martyred here. 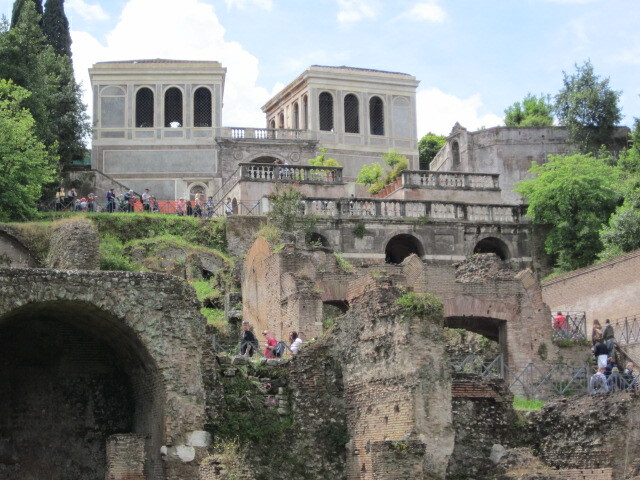 The other photos show the Temple of Castor and Pollux, then there’s me in front of the animal cages and passageways under the floor, and finally the Palatine Hill. 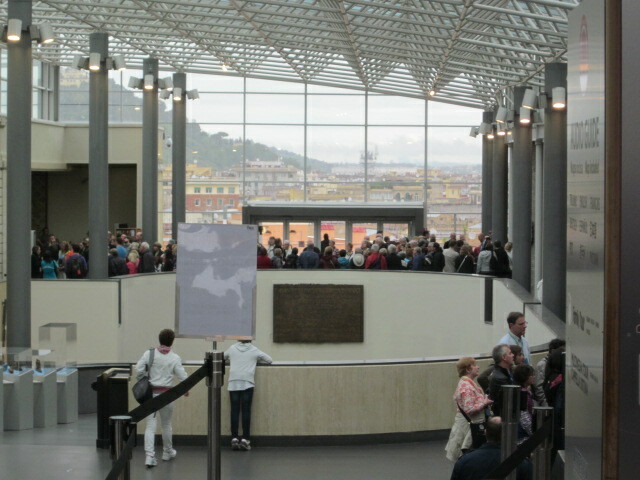 Afterwards, some travelers went on an Optional Excursion. We went back to the hotel to change for dinner. 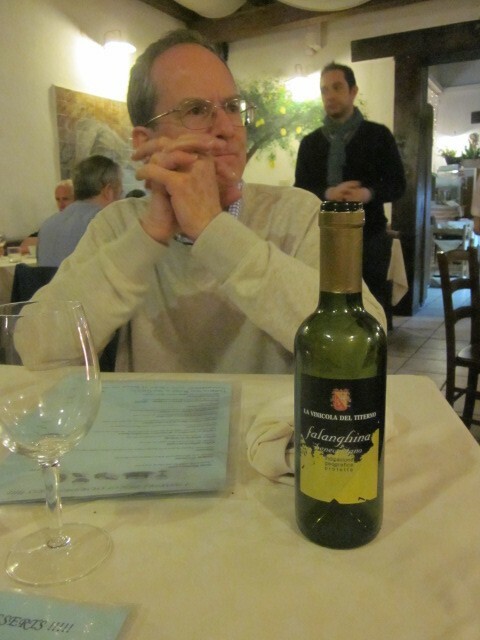 Saturday night we went to the Spanish Steps, and up to a restaurant our daughter recommended. 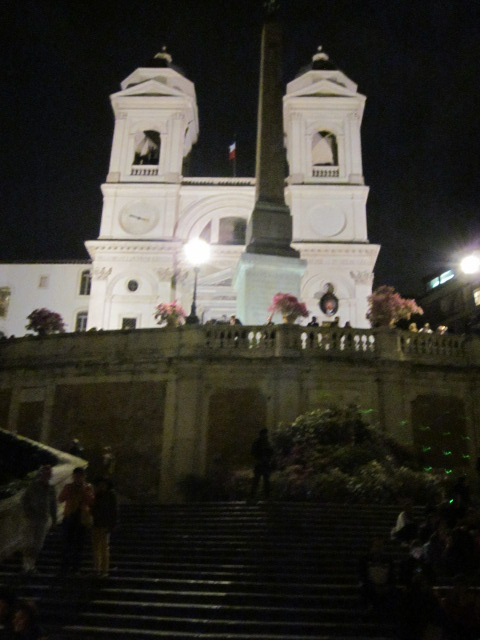 Here you can see the Spanish Steps, and above them the Santissima Trinità dei Monti Church. 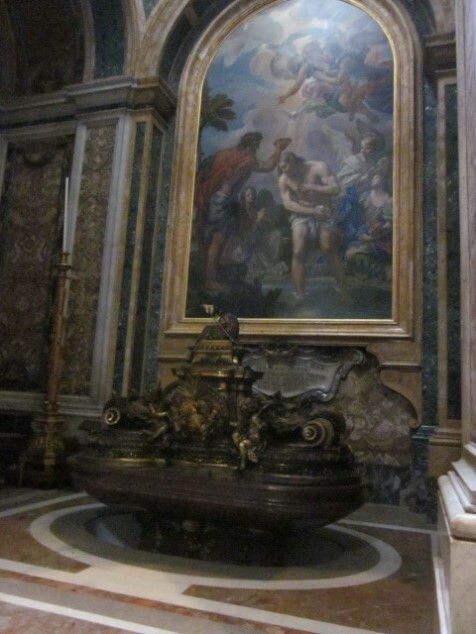 Sunday we went to mass at St. Peter’s. 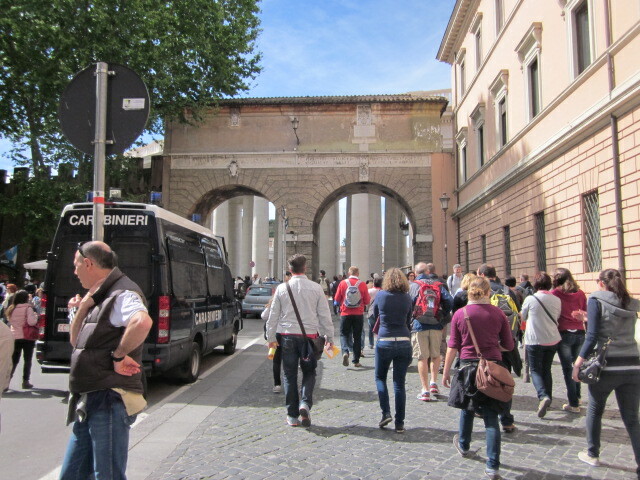 This entrance is a quick 14-block walk from our hotel. 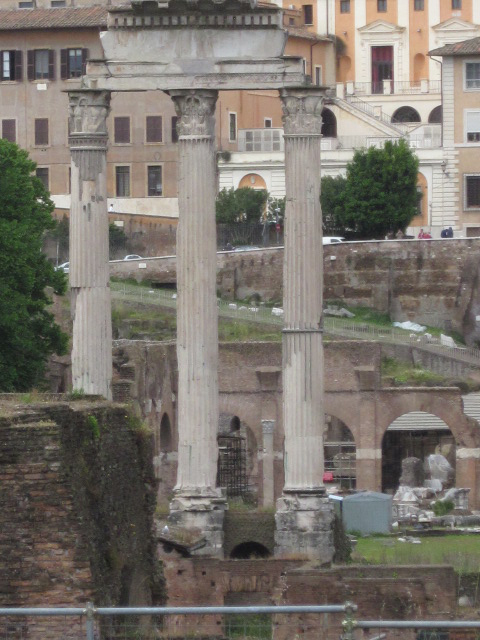 Here’s the colonnade around the square. 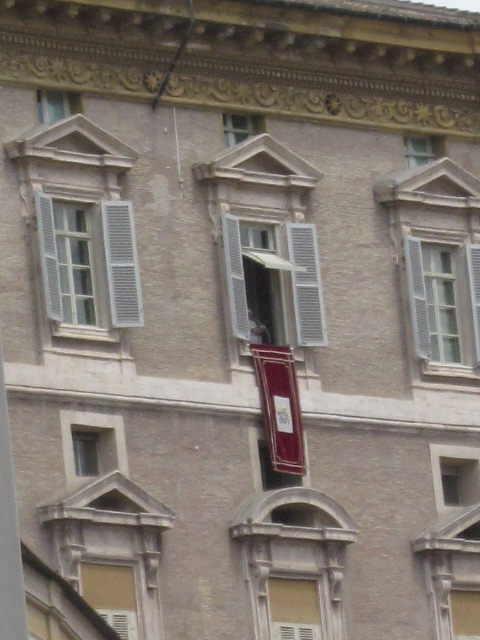 We stayed to hear Pope Francis lead the faithful in the noontime Regina Caeli prayers. He’s just above the banner. After breakfast on Day 4, Renata took us by motor coach to the train station, and walked us all the way to the train. 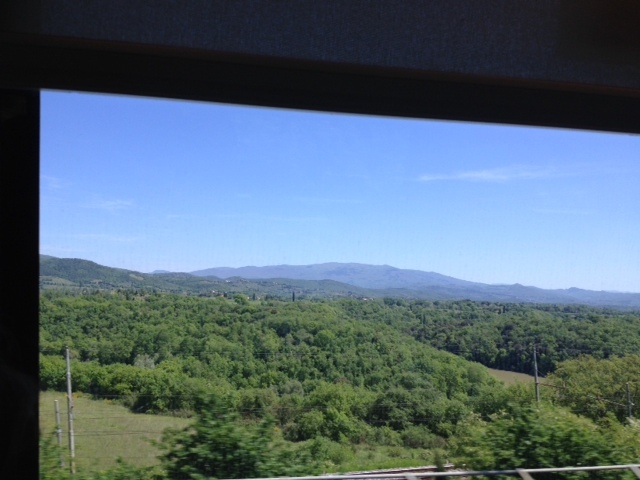 Here’s the view of some gardens on the way to the station, the Tuscan hills coming into view, and here’s a high-speed train at the Florence station. 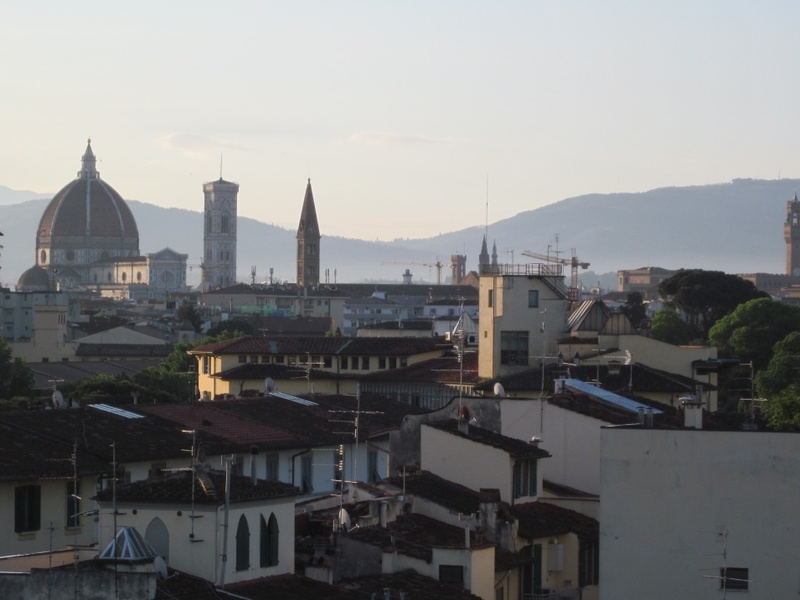 Our Florence Local Host, Helma, met us and took us to the very modern AC Firenze hotel, where we checked in and ate an excellent dinner. 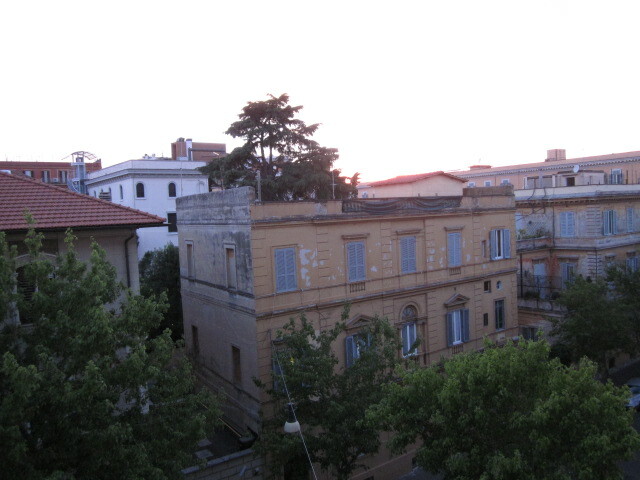 The skyline view is from the hotel. On Day 5, after a big breakfast, Helma met us there with the motor coach for a half-day of sightseeing on foot, with the help of Local Guides. 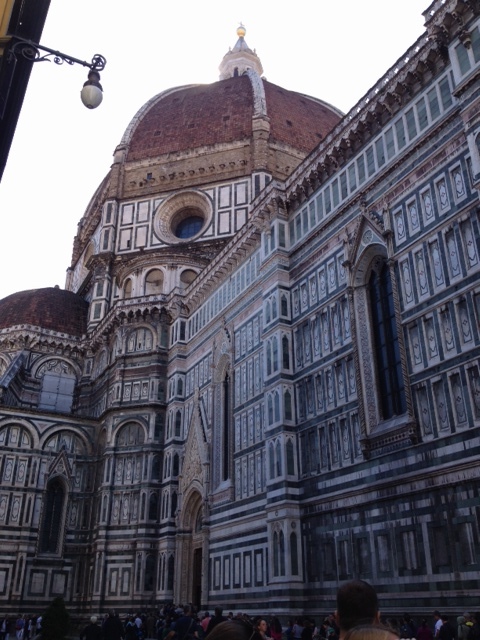 We went to see Michelangelo’s David (no photos allowed), the Duomo, the great cathedral of Florence, and the Uffizi Gallery (no photos allowed). Here’s a view from outside. 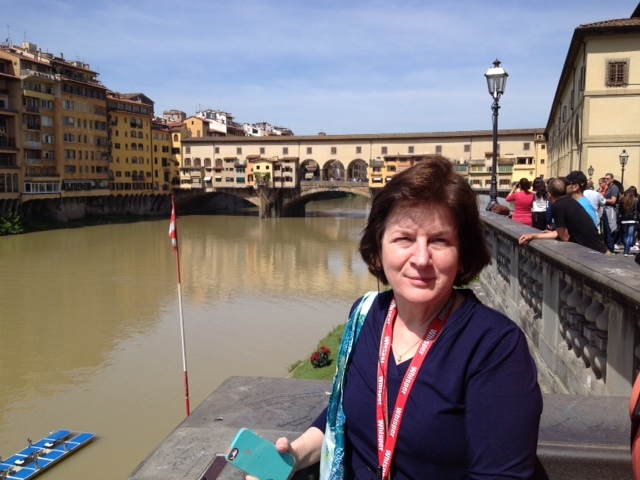 And also right outside, here’s Susan in front of the Ponte Vecchio. The next day, Day 6, we went to the ATM for more shopping money (2 blocks away, across from the tram stop). 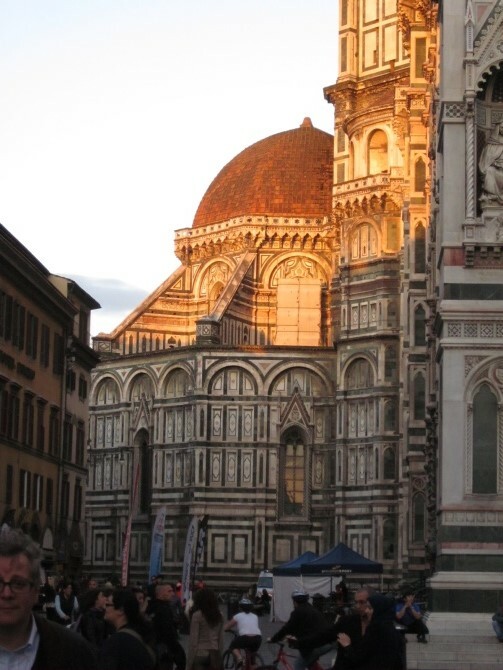 We visited the Duomo again, and here are two sunset photos. We happened onto a food products & cooking exhibition at the Mercato Centrale – so more shopping. We bought handmade papers in the market square, plus small leather items for gifts. 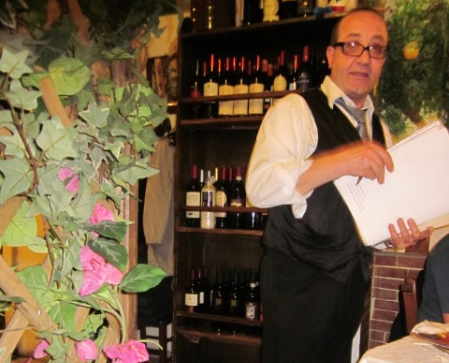 That night we ate at Il Porcospino, recommended by our son-in-law, where Franco served us well. 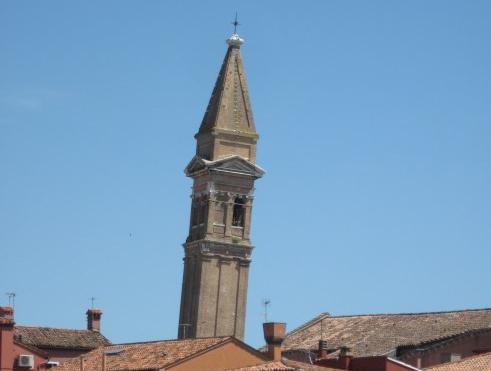 On Day 7, Helma took us to the train station, sending us on another high-speed trip through the countryside. 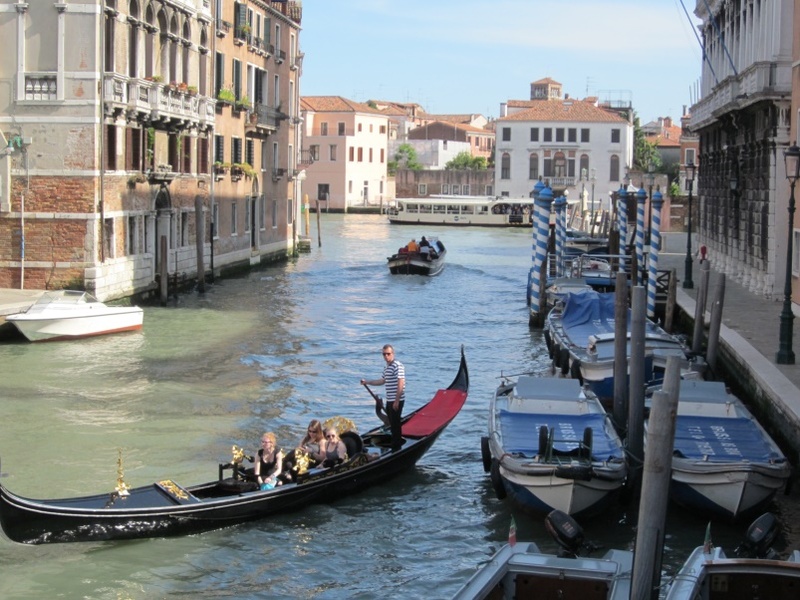 By early afternoon we were in Venice, where the Local Host, Diana, picked us up and took us by boat to the hotel Principe. We walked around a little. Here’s a view from the Ponte delle Guglie, crossing over the Cannaregio Canal to the nearby Jewish Quarter, and the Rialto bridge over the Grand Canal. 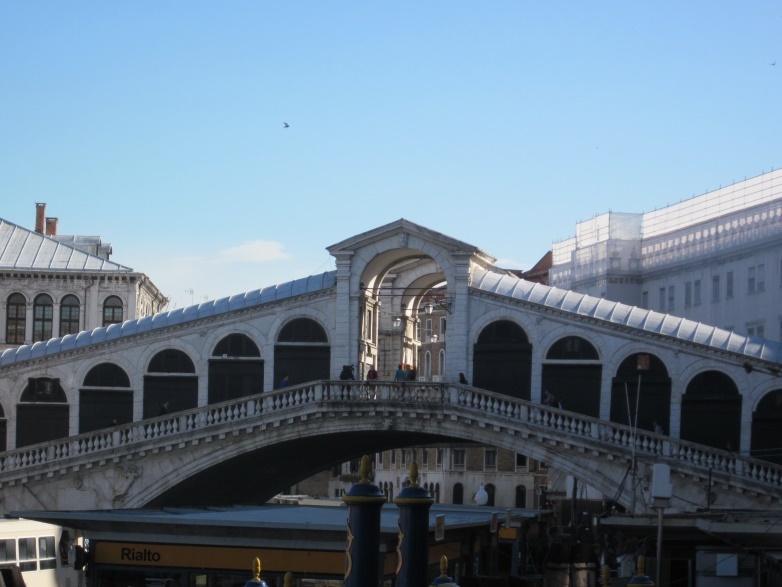 On Day 8, Diana took us to St. Mark’s Square by boat, where we toured the Doge’s Palace, St. Mark’s Basilica, the Bridge of Sighs, and the Vecchia Murano glass factory. 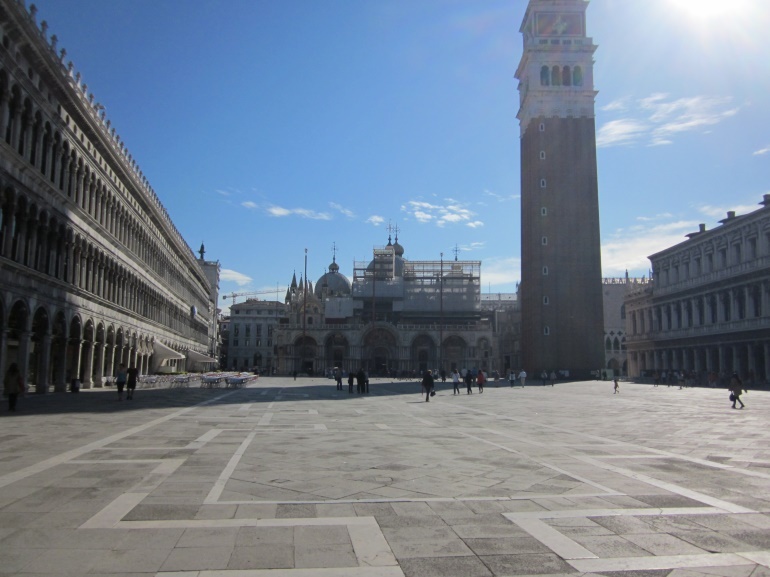 Here are pictures of the square, the palace courtyard with the domes of St. Mark’s behind it, the famous bell tower, and the entrance from the upper loggia to the Doge’s Palace government rooms. 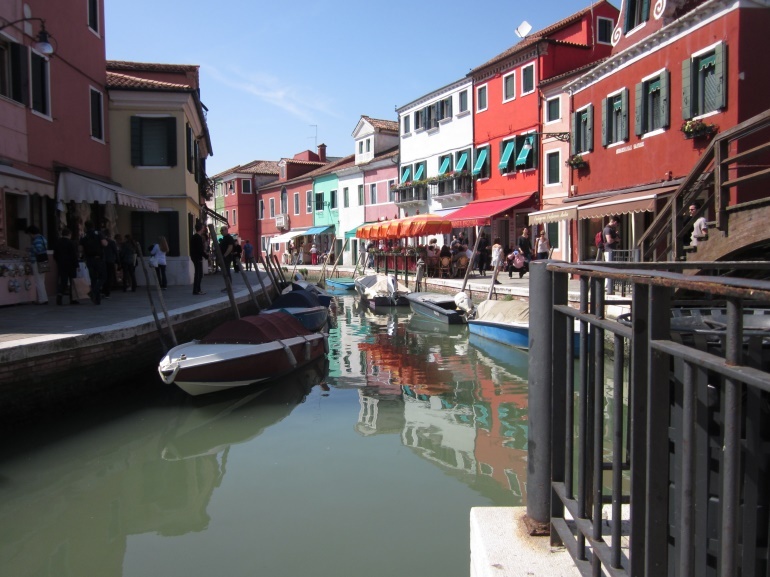 On Day 8, we took an Optional Excursion to the island of Burano, in the Venetian Lagoon, home of fishermen and lacemakers. We had a delicious 5-course lunch at a local restaurant. 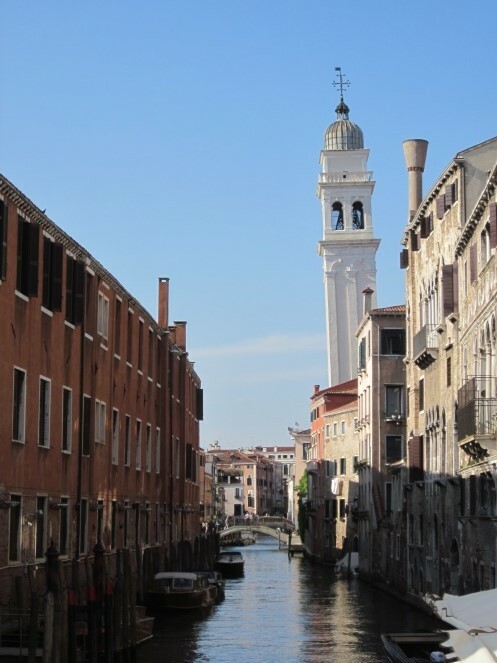 Here are views from the boat leaving Venice, Burano’s own leaning tower, and the canals and shops of Burano, where paint colors are controlled by law. 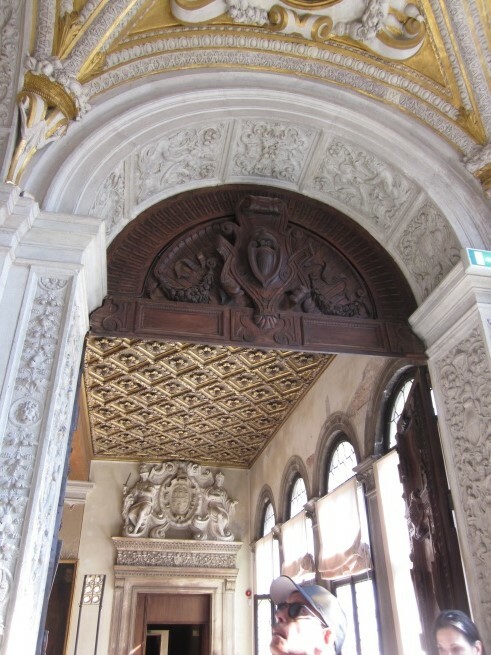 After the visit, we had to be sure to get back aboard the boat to Venice – because there are no hotels if you miss the boat. Day 9 was our Big Walk. 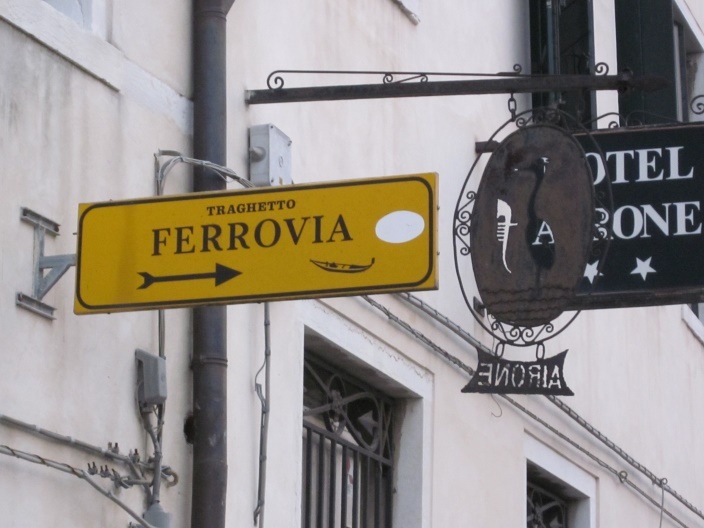 I decided we needed to come back again for a full week – we want to walk every tiny street in every district, on each of Venice’s dozens of islands! 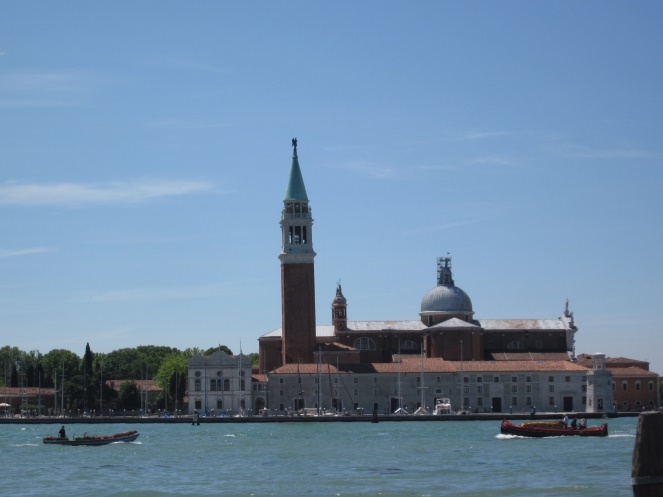 Here are some final views of Venice: A yellow directional sign – they’re everywhere to guide you, a gondola serenade, a sidewalk shrine, and the Church of San Simeon Profeta. 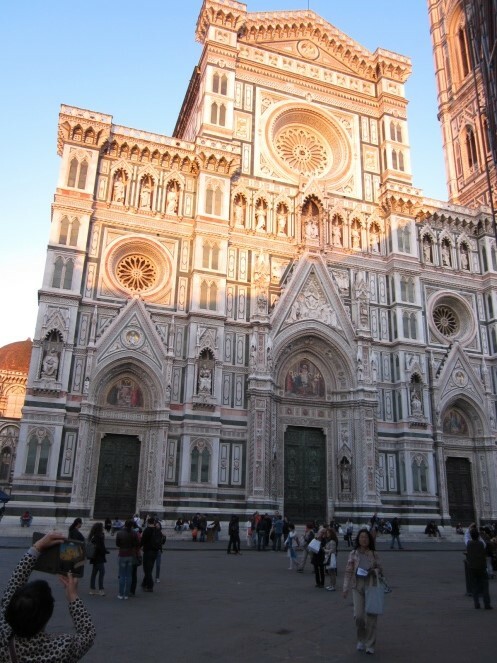 That evening, we bought sandwich fixings and snacks at a grocery store in Santa Croce, to eat while packing up. The morning of Day 10, Diana met us at the hotel. She had all of our baggage brought down to the lobby. When it was time to go, she took the travelers with her who needed transfers to the airport; that is, the ones with Monograms Contract Air. 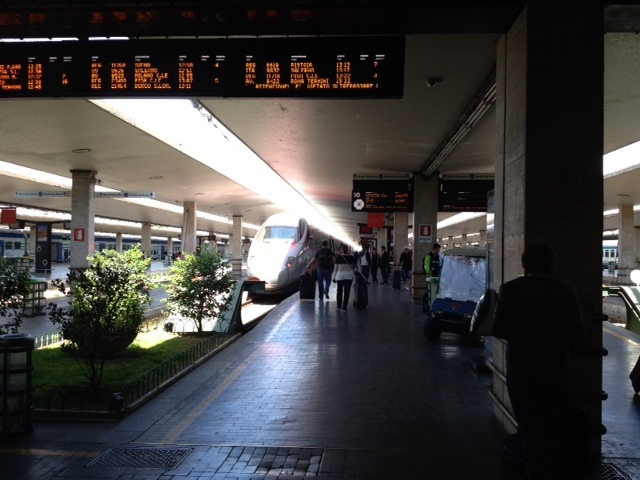 Because Susan and I were going over to Milan by train, Diana directed us (the 2 blocks!) 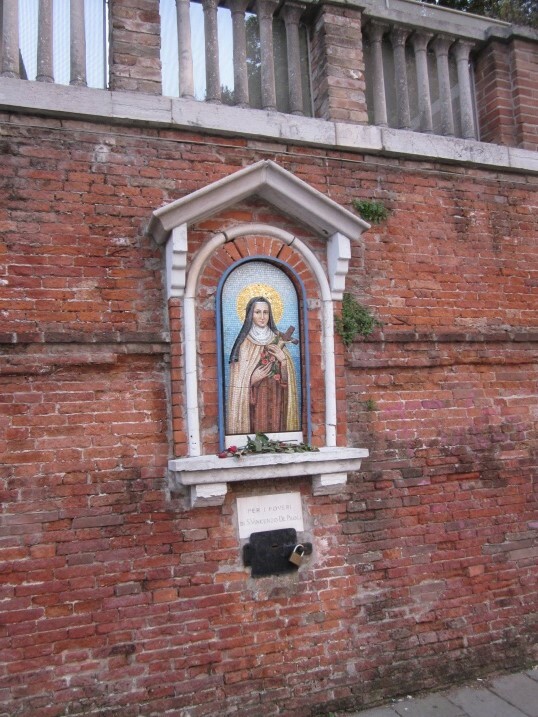 to the Santa Lucia train station. 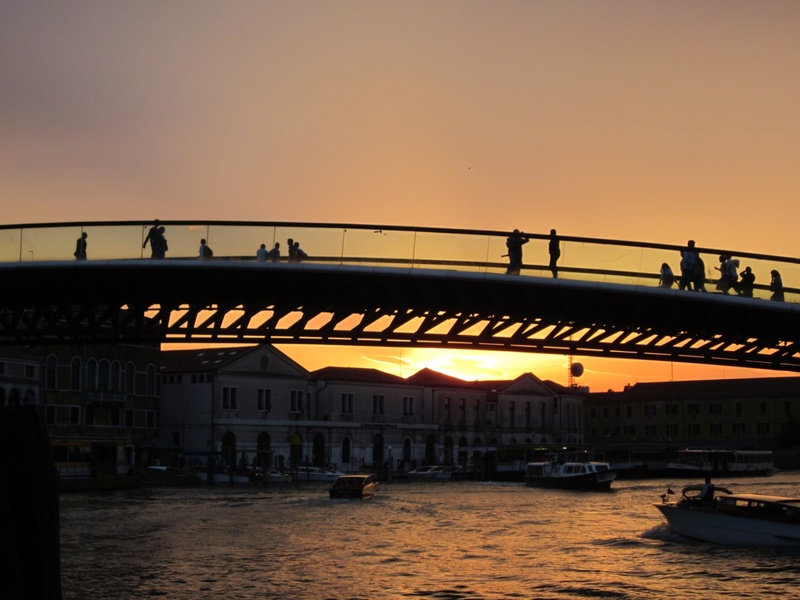 And now, until the next trip to Venice, I’ll close with a view of the sunset behind the Calatrava Bridge. Questions or comments about this story? 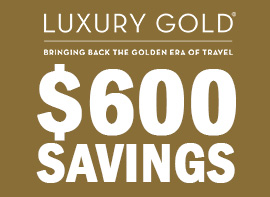 Tell us what you think in the comments below!